Among all of the products released at the ATA show, I’d have to say this would be the one I heard about most and it created a bit of buzz. This is a separate company from Lone Wolf and has been created by the original Lone Wolf founders Andrae and Cody D’Acquisto. The stand is remarkably light, coming in at 7.5lbs. The platform is 27” x 19.5” and has a fully leveling seat and platform. This stand could very well change the game for mobile hunters. It rings in at $499.00. The climbing sticks also seemed next level. You can get a full sized stick or a mini stick. These sticks pack down to in incredible 3/4” profile and stack securely to each other and to your stand. You can purchase the sticks singularly or in 4 packs. A 4 pack of the full sized sticks cost $349 and a single is $90. A four pack of the mini sticks cost $299 and a single one is $80. Though expensive, this run and gun setup could be a game changer. 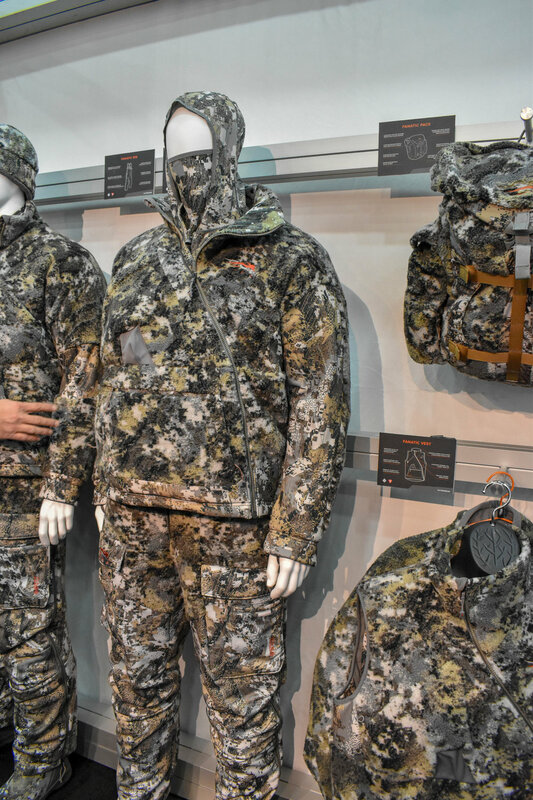 New for 2019, Sitka Gear has redesigned their Fanatic System. The new Fanatic System is quieter by 50% and warmer than ever before. Pockets were moved around to reduce bulk and they have a new design allowing you to keep your harness on while layering up and down. The Fanatic Jacket is also offered with left and right handed shooting configurations based on how the material on each arm is constructed. My personal favorite part is the bibs, which now boasts new burr resistant fabric so you won’t be dealing with as many headaches. The new Fanatic Jacket will be $449 and the bibs will be $439. Here you can see how the new bibs won’t collect burrs like the original fanatic bibs. Rage has taken their popular Hypodermic broadhead to a new level by creating one that gets rid of the shock collar completely. It more or less takes the Hypodermic and makes it a little more fool proof. The new broadhead still delivers a 2” cutting diameter. I’m guessing there’s a good chance I’ll be picking up a pack of these broadheads before too long. These will sell for $49.99 for a 3 pack. BowFest is a 3-D archery event put on at Mont du Lac Resort in Superior, WI and is the Midwest’s largest 3-D archery and music festival. If you are someone who is looking for a fun filled weekend of archery in July, this is something to consider. Right now, tickets are $79 for the whole event (July 25-28), but those will be rising incrementally soon. After going through many different products on the show floor of the 2019 ATA show, these are the four that I would most recommend if price wasn’t a factor. I think they all have their pros and cons, but these four are some of the best of the best.